Read more with these sure-fire tips; because everyone deserves to curl up with a big blanket and a good book once in a while. P.S. : All these tricks are keeping me on track for my reading challenge this year! Thank you to Chapters Indigo for providing me with “Five Feet Apart” as my second novel of 2019. All opinions are 100% my own and I am so excited to share my review with you! At the start of every year, I set myself up with a number of books to read. However, since becoming a mother, my annual reading challenge has proven a bit more difficult. Prior to having kids, I could easily read 50 novels in the span of 12 months. But, with lifestyle changes and an unpredictable schedule, I’ve had to adjust accordingly. You know what? You should, too! If you’re looking to read more, here are some methods that I use. There’s always time for a good book! Rather than skimming your phone before bed, whip out your current novel and get in some reading time then. Hint: if it’s ‘lights out’ for everyone and a lamp would bother your partner, consider getting a mini clip-on light to facilitate this new reading habit. Hit the Road with Your Books! Our family is consistently on the road and since Joe is our primary driver, I take the passenger’s seat and have the advantage of down-time to read. You can also do this if you take public transportation to work, school, etc. It’ll make the commute seem a lot quicker! Work it out with your family to schedule some personal time for yourself. I like to hop in a warm bath and get lost in a good book! I find it relaxing and it is rewarding that I’m steps closer into achieving my reading goals. During the summer months, I make my way to the local park and take a moment to read there. As mentioned, I set myself up with reading goals at the beginning of each year. I use Goodreads to keep track of the books I’ve read and it really keeps me motivated. You can even create your own tracker by jotting down your progress in a pretty notebook. I think lists and trackers help you to hold yourself accountable to reading on a more regular basis. If independent reading isn’t as motivating for you, then consider joining a book club! Again, in order to read more, there has to be some sort of accountability. Stories may be more interesting for you when you hear the opinions and perspectives of peers and friends. It’s all about finding the right titles. 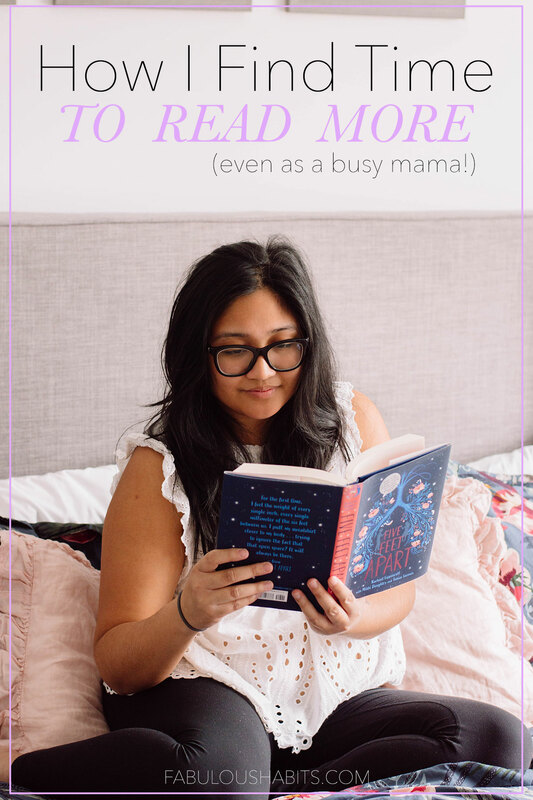 Whether I’m browsing my favourite book store or getting recommendations from my friends, I make sure to jot down a list of titles as potential future reads. Getting excited about my next novel gets me extra motivated to read more. Regarding the progress for of my latest reading challenge, I’d say I’m definitely on track. In fact, I have wrapped up book number 2 (out of 12) and swept right through it; mainly because I was so excited about it. Inspiring, emotional, and pages filled with love; “Five Feet Apart” is an unexpected love story. Stella and Will are cystic fibrosis patients. With this condition, cystic fibrosis patients are told to stand at least six feet apart from each other. But Stella takes a leap of faith and ‘steals’ the extra foot – just like everything has been stolen from her since her diagnosis. 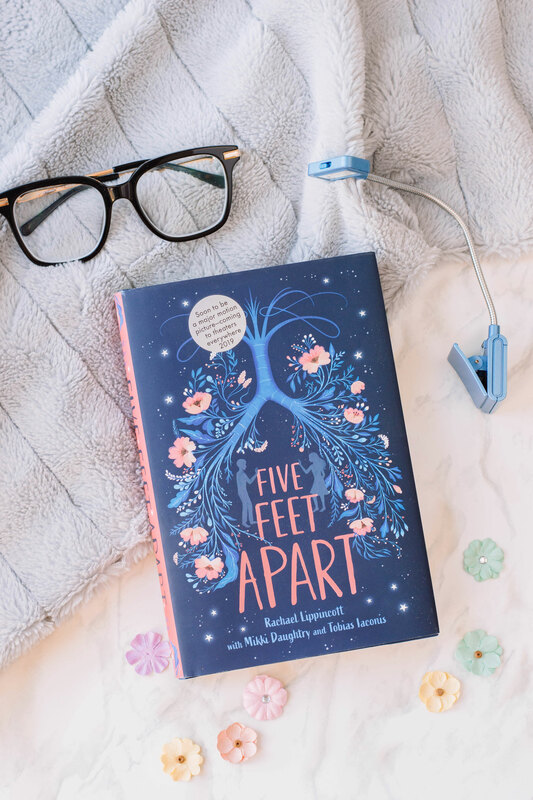 I’m so happy to claim “Five Feet Apart” as my second read for 2019. It actually made me reminiscent of reading Nicolas Sparks’ “A Walk to Remember” for the first time; mainly because of its heartbreaking yet inspiring plotline. Be sure to get your tissues out for this one. I highly recommend “Five Feet Apart” and can’t wait for the motion picture, set for early spring, and starring Haley Lu Richardson and Cole Sprouse (yay!). 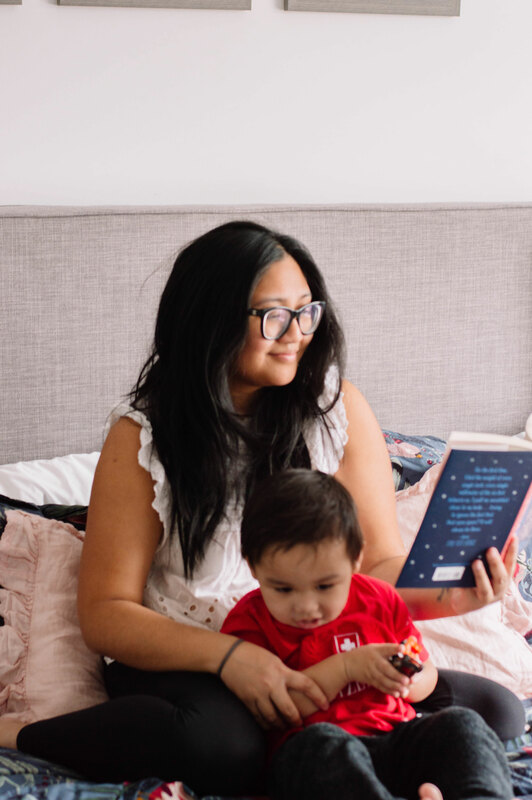 Mamas (and Papas), how do you find ways to read more? Funny story – I hate reading, so this is not an issue for me at all LOL. My husband on the other hand can’t keep his head out of a book and goes through 15-20 books a month on average. I NEED to do this! I love to read but don’t do it nearly enough! I love getting under a blanket with a great book and just read! You have some great tips and I will use a few of these! It always seems I can never find time to read! Life gets hectic, and before I know it, it’s bedtime. Your tips, especially reading before bed, will help to get in some much-needed reading time! There is nothing like getting lost in a good book is there! These sound like some wonderful tips to try and make you time when you are a Mum as well. This is making me feel so bad because it has been so long since I made the time to read. I hope as the summer nears I will be able to get motivated. My biggest problem is finding a book. I tend not to have much time to investigate and find something I would like to sit and read. I always make sure I have time to read. It’s one of my favorite things to do, so I make sure to do it daily. If it means not wasting time on Facebook, I’ll do it! If you honestly want to read more just turn off the tv and start reading. Hit up the library for free books and gives you a time limit so you have to get that book read. These are good suggestions! I wish I was able to read in the car without it making me sick. I always read at night! My husband and son are really early risers, but I am a night owl. So when everyone else is asleep, I take time to read. This is a constant struggle for me. I have a pile of books that I want to read but never seem to have the time to read them. Thanks for the helpful tips. Here’s to more reading, and soon. I’m a reader so I am in practice with all these ideas, however, I don’t have a cute little baby and that makes me all jealous! 🙂 Ha! What a cutie! I’m dying to find the time to read, so I’ll gladly take any tips I can get. Reading is one of the things I loved doing before I became a Mom. I’d love to find that time again. I have to work on adding reading to my daily routines and creating special time for it. I used to read a lot but life has just been so hectic. I hope I can find time soon. Thanks for the tips. I wish I enjoyed reading more often than I do actually read a book for personal pleasure. I am a home educator, so I rarely read for pleasure anymore, just textbook reading. I keep increasing my reading goal each year. It is hard but book club does help. Oh, I soooo need to find time to read more! I have a pile of books stacked up & ready to roll. Thanks for sharing these tips! I LOVE this .. and I actually do all these. It’s really amazing to me when people say they don’t have time to read. Coz I don’t go anywhere without my books. These are great tips! I don’t have the free time that I used to so it takes me a LOT longer to get through a book, but I’ve been using the read before bed tip > scrolling. It might only be a few chapters a day but that’s better than none! I’ve been trying to make time to read right before bed, but something always comes up. I used to read 2 novels in a day before! And I love finding good books on Goodreads! However, I haven’t read a good book for almost 3 months now and this post is definitely a wake-up call for me. I loved your suggestions.You are so right.There is nothing like curling in bed with a good book. A book club is a GREAT idea!! I haven’t considered that one but I’ve really been wanting to read more! I definitely need these tips in my life! I have such a hard time completing the book I started! These are some great tips to read more often. I also have trouble making time reading, due to busy working schedule and family commitment. I am consider to join a book club and start with the books the other members recommend. I love curling up with a good book but my schedule keeps me on my toes! I should join a book club to get back into my hobbies! Between work and raising kids, it can be hard to physically read a good book. For the meantime, I listen to audiobooks instead! these are such great tips. my boyfriend and i have made it a goal to read more this year and we like to set some time at night before going to sleep to read for 30 minutes 😉 it’s so nice! Reading is such an essential part of my life. Your tips are really great! Will keep these tips in mind.